Kicking off with one very popular Pokemon in the game. A Pokemon with a lot of story and has very unique characteristics that make it so admirable. This pokemon is the one and only Rotom Wash.
An evolution of the original Rotom, this Pokemon is a generation Five (Gen V) Pokemon. Rotom can evolve into many evolutions including our featured Rotom Wash, Rotom Heat, Rotom Fan, Rotom Frost, Rotom Mow. Mysteriously, Rotom starts as a ghost and electric typing and is able to do something quite spooky. It takes control of household appliances in order to evolve. Maybe you have got the pattern here relating to the choices of evolutions I had just mentioned. If it takes control of a freezer, then it becomes Rotom Frost… If it takes control of a lawn mower, then it becomes Rotom Mow… I wish this Pokemon was real because if it took control of my electronics in my phone store, then I would be rich! Yes, we are going to talk about Rotom Wash which is the most popular and debatably the favoured evolutionary path of Rotom. Why is Rotom Wash the most popular compared to the other evolutions though? Well, this is mostly due to its strength within the game. I will explain this further when talking about Rotom Wash’s impact towards the game under section “The Game”. Starting with the Pokemon artwork, I personally saw this a few months ago while browsing the internet for a Pokemon wallpaper. This piece of artwork was created by SaiorClef and mostly creates artwork towards Pokemon and some other Manga or Anime cartoons. 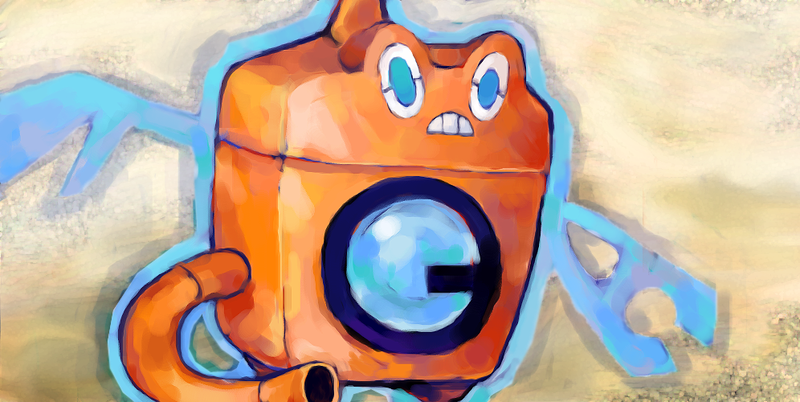 Most of SailorClef’s artwork is the same style to this Rotom Wash piece. It is firstly produced on real paper to then be digitally enhanced on computer. The method used to draw this art is with the use of water colour. Water colour usually provides a much more lighter style to it, but when provided thickly, then the outcome is more like this. The environment for the art perfectly captures the essence of Rotom Wash as is character. Rotom, being the evolutionary precursor to Rotom Wash has a ghost typing and is a ghostly entity. This art characteristic is captured perfectly with the dusty background and Rotom’s facial expression showing confusion. Rotom Wash itself stands out which is perfect and and the different shadings used on its bright orange body makes this art aesthetic to the max. With this art being further digitally enhanced to make it smoother and removing marks that would hinder its appeal, this has become a much liked personal piece of mine. If you’re interested in viewing more of SailorClef’s art, then take a look at his artwork. Rotom Wash doesn’t make much of an appearance in any of the Anime series. However, there is one moment it’s precursor (Rotom) did. In the episode To Catch a Rotom!, Professor Oak actually caught a Rotom on the island called Torom Island. Also, in two other episodes Rotom made small appearances in all of its evolutionary forms. One where Rotom toys with Ashe (turning into all the forms) and the other turning into Wash, Mow and Frost Rotom. As a Generation Five Pokemon, Rotom Wash hasn’t had much chance to have an appearance in the Anime. Hopefully, my predictions and hopes for Rotom Wash will make an appearance during a film or TV episode where Ashe or another major character catches Rotom and decides which evolutions to choose and shows the entire process. It would be insane! During the story of the games released after the Gen V games Black and White, you have a choice of which house appliances you wish Rotom to posses. Initially you could only catch one Rotom and only have a choice for one appliance, but if you have one traded, then you can choose more. Other than the story, what makes Rotom Wash so popular is its strength for battles. Rotom Wash keeps its Electric typing from Rotom, but replaces the Ghost typing with Water. These typings together give it strong defensive and offensive capabilities along with being able to learn many good moves along the way. Rotom Wash is one of the Pokemon I look at when considering a team for Pokemon battles. This is all because of its perfect typing, stats, available moves and more; not to say that Rotom Wash is an incredibly unique Pokemon which looks amazingly cool. This is why Rotom Wash has made our first post for the Docs Bolts website.